AllocById func for when we manage the Storage ptr itself. Definition at line 257 of file util-storage.c. References StorageMapping_::Alloc, BUG_ON, StorageList_::id, StorageList_::map, SCFree, SCLogDebug, SCMalloc, StorageMapping_::size, StorageMapping_::type, and unlikely. Definition at line 239 of file util-storage.c. 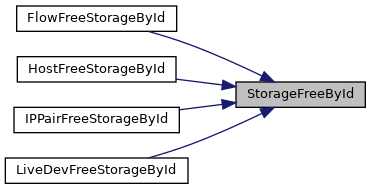 References StorageMapping_::Alloc, BUG_ON, StorageList_::id, StorageList_::map, SCLogDebug, StorageMapping_::size, and StorageMapping_::type. Referenced by FlowAllocStorageById(), HostAllocStorageById(), IPPairAllocStorageById(), and LiveDevAllocStorageById(). Definition at line 75 of file util-storage.c. References StorageList_::next, next, SCFree, and STORAGE_MAX. Referenced by DetectHostbitFree(), DetectXbitFree(), FlowStorageRegister(), HostFreeStorage(), IPPairStorageRegister(), StorageFree(), and TagTimeoutCheck(). Definition at line 139 of file util-storage.c. References StorageMapping_::Alloc, StorageMapping_::Free, StorageList_::id, m, StorageList_::map, StorageMapping_::name, StorageList_::next, next, SCFree, SCLogDebug, SCMalloc, StorageMapping_::size, STORAGE_MAX, StorageMapping_::type, and unlikely. Referenced by DetectHostbitFree(), DetectXbitFree(), FlowStorageRegister(), HostFreeStorage(), IPPairStorageRegister(), PostRunDeinit(), RunUnittests(), StorageFree(), and TagTimeoutCheck(). Definition at line 333 of file util-storage.c. 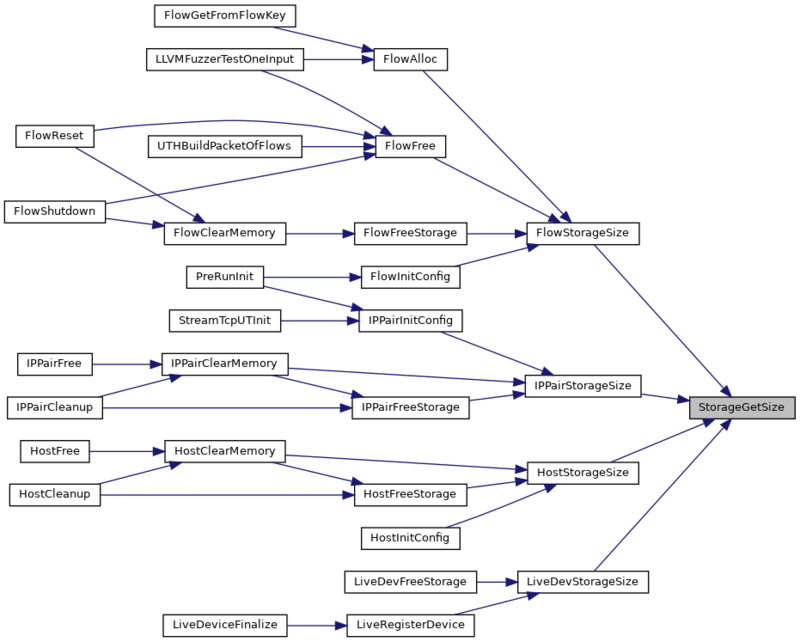 References BUG_ON, StorageMapping_::Free, StorageList_::map, SCFree, SCMalloc, STORAGE_FLOW, STORAGE_HOST, StorageCleanup(), StorageFinalize(), StorageInit(), StorageRegister(), and StorageMapping_::type. Definition at line 310 of file util-storage.c. References BUG_ON, StorageMapping_::Free, StorageList_::map, and StorageMapping_::type. Referenced by FlowFreeStorage(), HostFreeStorage(), IPPairFreeStorage(), and LiveDevFreeStorage(). Definition at line 288 of file util-storage.c. References BUG_ON, StorageMapping_::Free, StorageList_::id, StorageList_::map, SCLogDebug, and StorageMapping_::type. Referenced by FlowFreeStorageById(), HostFreeStorageById(), IPPairFreeStorageById(), and LiveDevFreeStorageById(). Definition at line 216 of file util-storage.c. References BUG_ON, StorageList_::id, and SCLogDebug. Referenced by FlowGetStorageById(), HostGetStorageById(), IPPairGetStorageById(), and LiveDevGetStorageById(). Definition at line 200 of file util-storage.c. Definition at line 211 of file util-storage.c. Referenced by FlowStorageSize(), HostStorageSize(), IPPairStorageSize(), and LiveDevStorageSize(). Definition at line 67 of file util-storage.c. if size == ptr size (so sizeof(void *)) and Alloc == NULL the API just gives the caller a ptr to store something it alloc'ed itself. Definition at line 99 of file util-storage.c. 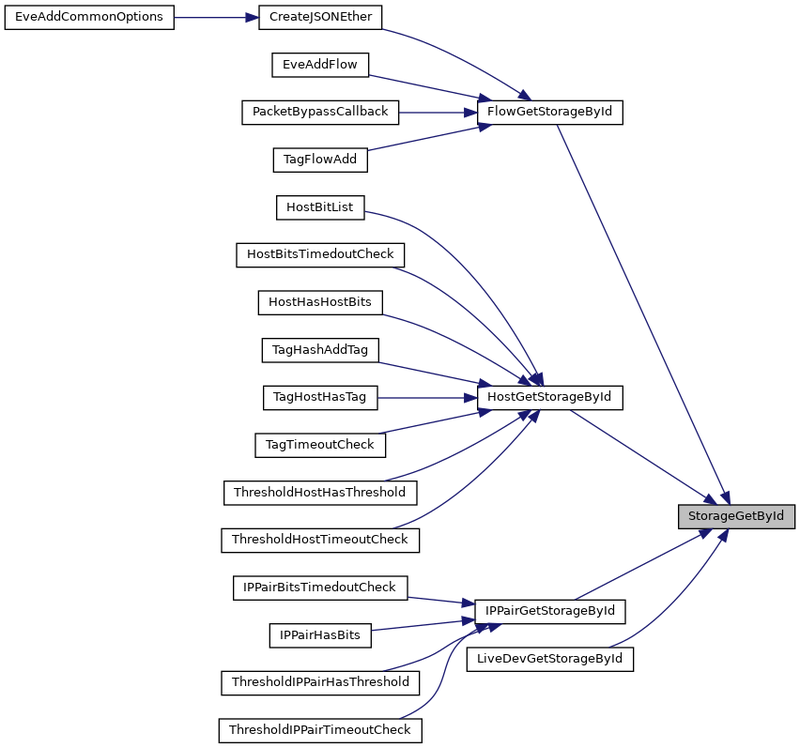 References StorageMapping_::Alloc, StorageMapping_::Free, StorageList_::id, StorageList_::map, StorageMapping_::name, StorageList_::next, SC_ERR_INVALID_VALUE, SCLogError, SCMalloc, StorageMapping_::size, STORAGE_MAX, StorageMapping_::type, and unlikely. Referenced by FlowStorageRegister(), HostStorageRegister(), IPPairStorageRegister(), LiveDevStorageRegister(), and StorageFree(). Definition at line 545 of file util-storage.c. Definition at line 227 of file util-storage.c. Referenced by FlowSetStorageById(), HostSetStorageById(), IPPairSetStorageById(), and LiveDevSetStorageById().